Looking for a healthy gift for the holidays? Check out these walnuts. Snack Girl is thrilled to feature a post from Bran Appetit. Brandi, author of Bran Appetit, has gone through a weight loss journey. She gained a bunch a weight in college and then did something most of us wish we could do - transform! Amazingly, my weight has stabilized now and it’s easier for me to maintain now than it was the first few years after hitting my goal weight. Once I got the “good food, bad food” thoughts out of my head, eating balanced just started to become natural and not something I had to struggle with on a daily basis. Last year, my family decided to send more money to Jovenes (the orphanage we support in Honduras) and make as many Christmas gifts that we could. Nick and I ended up putting together a basket for each “family” that had all kinds of goodies! And I was thinking the other day – I never posted those recipes! I think the time just got away from me during the holiday season, and I haven’t thought about them since. Until now. Holiday baking is back on my mind. 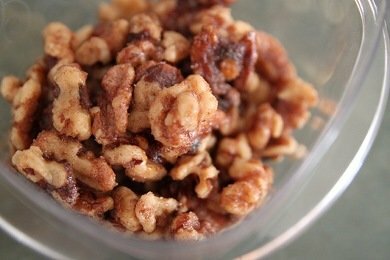 So I’m finally going to share my cinnamon sugar walnut recipe! 2. 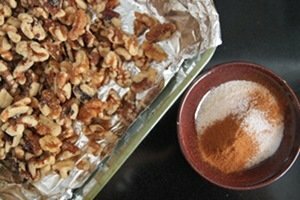 Line baking dish with foil and spread out walnuts. 3. Pour oil/melted butter over nuts and add cinnamon, sugar, and salt.Toss to coat. 4. Bake for 15-20 minutes, stirring halfway through. Let cool completely before packaging. Makes 10 servings. These would look great in a jar and tied with simple ribbon or tossed into a holiday printed bag. 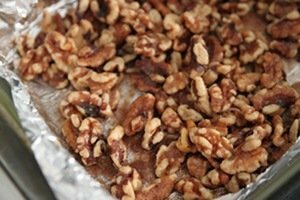 I’d love to serve these at a holiday party, too – having a sweet roasted nut and a savory one would be a great appetizer or snack to have out for family and visitors. Plus, homemade = cheaper and healthier, and I’m always up for that. What type of homemade holiday gifts do you give? Please share. McNugget Rot Results Are In! Fantastic! Thanks for sharing, love the gift basket idea for the holidays! These sound so easy and delish. Thanks, Snack Girl! What a wonderful story and it looks delish! Cannot wait to try! i'm going to make these! and i love that they went to making things to send more money to an orphanage. that is the spirit of the holidays. i look forward to discovering brandi's story. so happy to hear her shedding the "good" vs "bad" food mindset. thanks, lisa! Thanks, these sound like a great treat for the kids! It was eating and chatting with you in San Fransisco with our mutual friend Susie. I've been reading your blog ever since. THANKS. So useful. This recipe, along with the yummy brownie balls, will be gifts for everyone in the office this year. Perfect snack for the holidays. Can't wait to try it! Thanks!